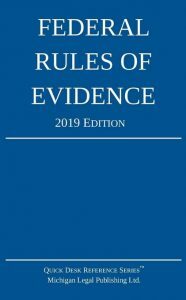 The Federal Rules of Evidence are a set of rules that governs the introduction of evidence at civil and criminal trials in United States federal trial courts. The current rules were initially passed by Congress in 1975, after several years of drafting by the Supreme Court. The rules are straightforward and relatively short, compared to other sets of court rules, such as the Federal Rules of Civil Procedure. This site hosts the most recent version of the rules, as amended each year by the United States Supreme Court, generally in March of each year with the changes taking effect in December of that year, including the latest amendments implemented on December 1, 2018.